3. What is Kumbh Mela ? One of the important activities for pilgrims is to take a holy dip in the holy river and to wash away their sins, as it is meant to be the belief. It has a deep importance especially for the Hindu community. According to Hindu mythology, during churning of the ocean (samundar manthan for the nectar of immortality between the gods & the demons a few drops of the liquid called amrita were fallen from the kumbha. Lord Vishnu dropped four drops of amrita (the drink of immortality) at four places on the earth name are Haridwar, Prayag (Allahabad), Ujjain and Trimbak-Nashik, while transporting it in a kumbha (pot).It is believed that according to the astrological start water of these holy rivers turned into nectar. These four places are considered as the present-day holy places of the Kumbh Mela. After every 3 years of interval this fair is organized at the bank of Holy Rivers of Hindus name are Ganga, Yamuna, Saraswati, and the Godavari. Kumbh in Allahabad (Prayag) is more important & wide as compared to other Kumbh Melas. It is believed that before the creation of the world, Brahma Ji (also known as Svayambhu or self-born) did Ashwamegha Yagya here. Along with Brahmeshwara temple, Dashwamedh Ghat is now present here as a sign of the Yagya. Because of this Yagya, Maha Kumbh also provides special importance. WHAT IS KUMBH MELA ? Kumbh means pot. The Kalash (pot) has a particular significance in the Hindu civilization. Kumbh is the union of nature and humanity, the source of energy. It realizes human their sin, virtue and light, darkness. The human body is made up of five vital natural elements: fire, air, water, earth, and sky which is together called “Panchtatva”. Ganga River is the mother of all in this festival, and all other rivers are her children. It is a difficult test of human devotion. People come here with a sense of pure mind and virtue. 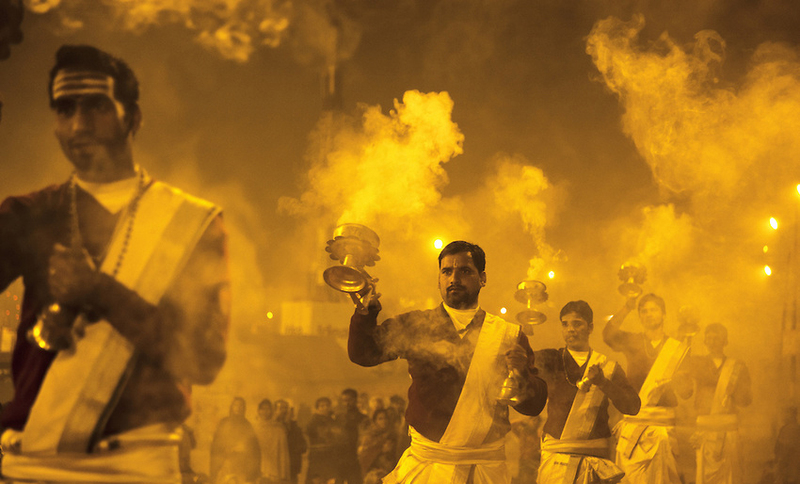 The monks, saints, artists of different religions & regions take part in Kumbh Mela. 2. Purna Kumbh Mela:- Purna Kumbh Mela comes every 12 years. It is held in 4 ritual places in India – Allahabad, Haridwar, Nasik, and Ujjain. It rotates every 12 years at these 4 places. 3. Ardh Kumbh Mela:- Ardh Kumbh means Half Kumbh which means half of 12 years duration. So, it is held after every 6 years in India only in 2 places in Haridwar and Allahabad. 4. 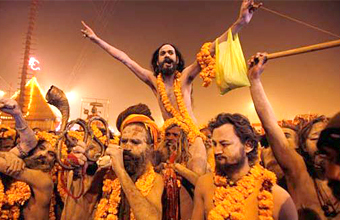 Kumbh Mela:- Kumbh Mela is held at four different places – Ujjain, Allahabad, Nasik and Haridwar. It is organized by state governments in which millions of people participate with great devotion and spiritual enthusiasm. 5. Magh (Kumbh) Mela:- The Magh Mela also called Mini Kumbh is held annually (once a year) only in Allahabad It is organized in the month of Magh according to Hindu calendar (14 Jan –February end). The Magh (Kumbh) Mela is also a famous annual pilgrimage event for Hindus. According to Hindu mythology, the Magh Mela is assumed as a starting point of the Universe. It is organized every year on the confluence of the 3 holy rivers. This confluence point is known as Triveni Sangam, the Prayag near Allahabad in Uttar Pradesh, India. In accordance with the traditional Hindu calendar followed in North India, this holy fair is organized every year during the Hindu month of Magh. The Magh Mela, is not confined only to the month of Magh and the important bathing dates are spread over a period of 45 days. It is actually a smaller version of Kumbh Mela. Hence it is also known as Mini Kumbh Mela. 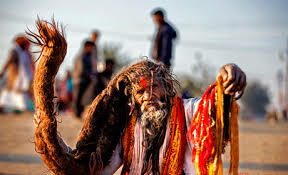 Every year, the Magh Mela starts from the day of Makar Sankranti in January ( first day) which is meant to be important bathing day according to the religious Hindu calendar. It begins with a large no. of pilgrims taking a holy dip at the Sangam on the auspicious dates. Hindus are known for their passion to celebrate their festivals in a grand way. Kumbh Mela is one such festival which is rejoiced by them. It usually takes 12 years to get repeat on the same location except Haridwar and Allahabad. There is kumbh mela every 6 years also. If one has to experience the holiest & the grandest way to celebrate Hinduism, then it is one of the right place for them. The Kumbh Mela 2019 is going to be held at Allahabad (Prayag) from January 14th, 2019 to March 4th, 2019. Every six years in Allahabad are celebrated in the month of January-February when Jupiter is in Aries or Taurus and in Sun and Moon in Capricorn during the Hindu month of Magh. Starting from 15th January to 04th March 2019, it will once again be the center of attraction and attention from all over the world. According to estimates, Ardh Kumbh Mela which is going to be organized in Allahabad, 2019. More than around 2 crore people are estimated to bath on this occasion. Next year the Kumbh Mela of Allahabad is going to be held commencing from 15th of January, 2019 (the day of Paush Purnima) till 4th of march, 2019 ( the day of Maha Shivratri) at the Triveni Sangam in Prayag. At the Kumbh fair, the crowd is always excited to see the Shaivanti Naga Sadhus. 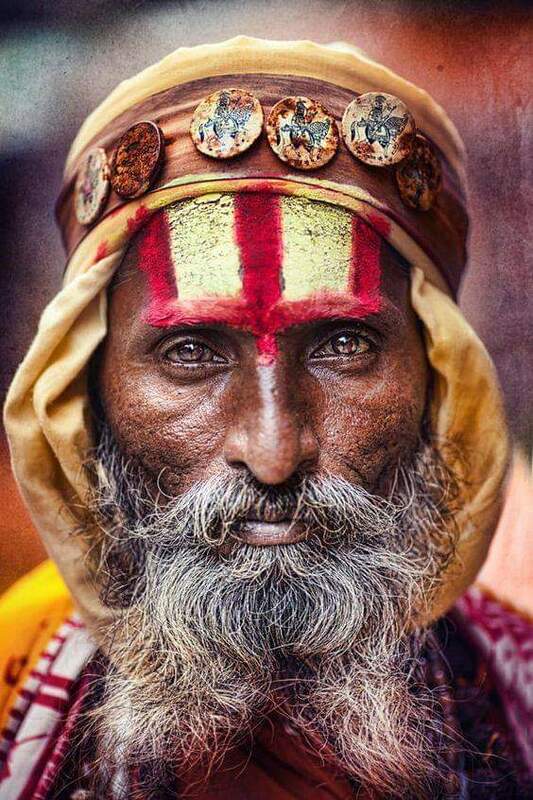 Foreign devotees are more eager to know about the mysterious lifestyle and philosophy of Naga sadhus. 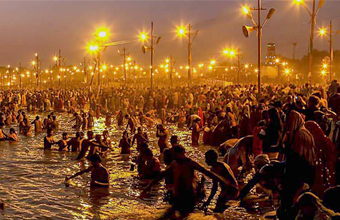 In the holiest royal bath of Kumbh, they get the right to take a bath first. They remain naked, enamored with their whole body. Their big hats are also the center of attraction. It is fantastic to see these saints having trident in the hands, screaming during the Mela. Ashes and three-legged Tilak on the heads – The Naga Sadhus, who stay naked and practice in caves, also mentioned in mythological texts. The latest Allahabad Kumbh Mela took place in 2013 which became the largest religious gathering in the world with almost 120 million visitors. The next one is scheduled for 2025, with an Ardh Kumbh Mela scheduled for 2019. 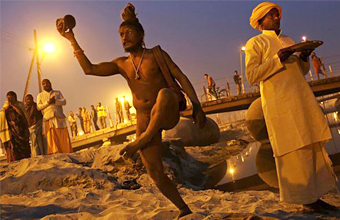 United Nations Organization, UNESCO has given Kumbh Fair an intangible cultural heritage of humanity. According to UNESCO, Kumbh Mela is the most peaceful religious gathering on the earth. This is the reason that a big number of Hindus from every corner of the world arrive at the fair to bathe in the holy rivers, or a ritual meant to clean them of sin and bring pureness to their lives. It attracts devotees in millions from all over the world. How to reach Kumbh Mela Allahabad ? Visiting Allahabad during this highly popular festival is nothing less than an adventurous trip. Of course, the excitement to watch this huge festival is one aspect, but the challenges and obstacles faced by the people, to reach the Kumbh Mela is the main point that makes the trip more adventurous. Allahabad being one of the important religious, educational and administrative centers in India offers the convenient connection with all the major cities of India. To explore the Allahabad Kumbh Mela, one can take any mode, from rail, road to air transport. New Delhi is the major metropolitan and the nearest metro city that offers a quick reach to the city of Allahabad. Distance between New Delhi and the Allahabad city is mere about 643km. However, other metro cities are also at a major distance from the venue of the Kumbh Mela 2019. Pilgrims can pick/choose the following mode to reach Allahabad and be a part of the great gathering. By Air: The Bamrauli Air Force Base is the nearest domestic airport to Allahabad, located at a distance of 12km. Pilgrims can take up flights of famous airlines such as Air India, Indigo, etc followed with the local cabs and interstate buses, which will board you directly from the airport to the Allahabad city. By Road: Allahabad is easily connected with the major cities of the country with its National and State Highways. Additionally, its local transport services, i.e. interstate bus, cabs, auto rickshaws, etc provides the immediate support to the pilgrims to reach to their destination. By Rail: Allahabad is the Headquarter of the Northern Central Railway that offers quick and smooth connectivity to the major cities of the country. Most pilgrims prefer to take rail transport to explore the divinity of the Allahabad Kumbh Mela. One can easily opt for any of the choices available. Precautions to take in Kumbh Mela: Proper planning and time management will really help to control the crowd and avoid stampedes. Take care of your children as it is the biggest fear of losing them in such a huge crowd. Ideally book a good room or hotel a month before. While taking holy dip in the river hold your child’s hand tightly & never let them bathe alone if they are small. Stay away from places of stampede & avoid highly crowded areas especially while you are with kids.